Silent auction display ideas for jewelry, furs & fashion. Gala auctions tend to have no shortage of jewelry. It’s across the board at my events … live auctions, silent auctions, bonuses, games, upgrades, etc. Some groups do a better job than others at showcasing the pieces. And then there are those random clothing items that are donated: dresses, furs, coats, and the like. 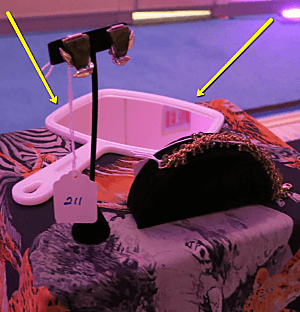 Given that your silent auction is — at its core — a retail store, what’s one good silent auction display idea for selling your wares? (Sidebar comment: Gosh, if you’ve spent any time listening to my webinars or teleclasses over the years, you know how much I harp on this “store” concept. One good idea is to use mirrors. Have you ever been to a store, held up a necklace, scarf, or hat, and then had to go hunt for a mirror to see how it looked on you? It’s annoying to go find a mirror. Personally, I’ve NOT made a purchase for lack of a mirror to see myself. 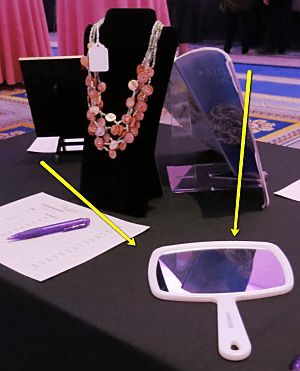 So if you’re selling jewelry at the gala, shouldn’t you include a hand mirror as part of your silent auction displays? And if you’re selling clothing, wouldn’t a full length mirror help your bidders make a buying decision? At a school auction a few years ago, a gently used fur was donated. The event manager put it into the silent auction. She wasn’t hopeful it would even sell. Cecelia, one of my floor crew members, opted to work that section of the room. Noticing that the fur wasn’t getting much traction, she started to promote it. When a likely target came near, she’d point out the fur. No woman is going to buy a fur without seeing herself in it first. And Cecelia was clearly hampered in that she had no way of showing each prospect her reflection while wearing the fur. Cecelia located the restrooms. She urged each woman to walk down the hall to where the student bathrooms were. As I recall, Cecelia only got one bid on the fur that night. But that was all we needed! It sold in the 4-figures and Cecelia was rightfully proud. How many clerks spoil the benefit auction broth? At our estate jewelry auction event, called Baubles & Bubbles (proceeds used to fund an endowed scholarship at University of Las Vegas Nevada), I couldn’t find mirrors, so I purchased beveled mirror tiles and used simple frame stands and they worked and looked fabulous. One per table. What a great idea, Tori! And I bet they *did* look fabulous. I would envision they looked elegant. Thanks for sharing.